Citrus Compound: Ready To Help Your Body! These days, juicy, delicious oranges are practically synonymous with vitamin C. But did you know that America's favorite fruit also provides healthful natural compounds called limonoids? In laboratory tests with animals and with human cells, citrus limonoids have been shown to help fight cancers of the mouth, skin, lung, breast, stomach, and colon. Now, ARS scientists in northern California—led by chemist Gary D. Manners of the Western Regional Research Center in Albany—have uncovered new details about these compounds. Their research has demonstrated that our bodies can readily access a limonoid called limonin, and all its health-imparting properties, each time we bite into a citrus slice or drink a glass of orange juice, for instance. This is the first time this bioavailability has been shown in humans. "Limonin is what remains after our bodies cleave a glucose, or sugar molecule, from limonin's parent compound, limonin glucoside," says Manners. "Limonin glucoside is present in citrus and citrus juices in about the same amount as vitamin C."
Though the similar-sounding names of these limonoids may be confusing, their positive impact on our health is becoming clearer with every experiment. In some individuals, limonin remains in the bloodstream for up to 24 hours—an impressive length of time—Manners and colleagues found. This longevity, or persistence, may help explain some limonoids' ability to fight cancer cells, which, if not continuously suppressed, may proliferate. The findings are good news for people who like oranges and the other appetizing citrus fruits rich in limonoids. The world's citrus-juice processors could also benefit; they could extract an estimated 300,000 pounds of these chemicals from peels, seeds, and other processing leftovers each year. Today, those leftovers, called citrus molasses, are sold as a low-cost ingredient in cattle feed. But thanks to a patented, ARS-developed process, these chemicals can be extracted from citrus molasses and used to fortify foods or beverages. For the bioavailability experiment, 16 healthy men and women volunteers downed a dose of pure limonin glucoside. The compound, a white, tasteless, odorless powder, was dissolved in about 4 ounces of water. Doses ranged from about one-eighth to one teaspoon. That's equal to the amount in seven glasses of orange juice. The participants gave blood samples before they drank the beverage and 3, 6, 12, and 24 hours afterwards. To avoid skewing test results, they didn't eat or drink any citrus products for 3 days before and 3 days after taking part in the study. The scientists looked for traces of limonin—the limonin glucoside byproduct or metabolite—in the volunteers' blood plasma. The laboratory procedure that the researchers used, liquid chromatography-mass spectrometry, can detect very small amounts of limonin. Limonin showed up in the plasma of all volunteers except one. For most volunteers, the concentration was highest within 6 hours after they drank the special beverage. Five volunteers still had traces of limonin after 24 hours. That's an indication of the compound's staying power, an important consideration, especially if limonin glucoside were to be used as a pharmaceutical, for example. In contrast, some natural compounds are bioavailable for shorter periods and have to be taken more than just once a day. An example: the good-for-you phenols in green tea last only 4 to 6 hours. 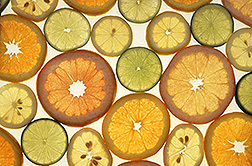 In this study, Manners collaborated with Andrew P. Breksa III of the Western Regional Research Center; Thomas S. Schooch, formerly of the center; retired ARS chemist Shin Hasegawa, a pioneering investigator of these citrus biochemicals; and Robert A. Jacob, formerly a chemist with the ARS Western Human Nutrition Research Center in Davis, California, and now retired. The group published their findings in a 2003 issue of the Journal of Agricultural and Food Chemistry. The Florida Department of Citrus helped fund the work. There's more to come from the California team. Manners and Breksa, along with chemist Darshan S. Kelley and molecular biologist Susan J. Zunino—both of the Davis nutrition center—are gearing up for a first-of-its-kind study of the cholesterol-lowering effects of limonin. 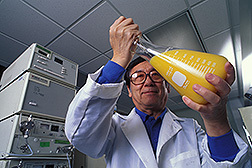 In 2000, Manners, Hasegawa, and their Canadian co-authors reported that limonin may be among the citrus-juice compounds that lower cholesterol. In lab tests, they found that human liver cells produced less apo B—a compound associated with higher cholesterol levels—when exposed to limonin. Preliminary results of the new cholesterol study are expected later this year. This investigation may provide more details about the health advantages of citrus and greater incentive for us to enjoy these sunny, delectable fruits and juices even more often.—By Marcia Wood, Agricultural Research Service Information Staff. This research is part of Quality and Utilization of Agricultural Products (#306) and Human Nutrition (#107), two ARS National Programs described on the World Wide Web at www.nps.ars.usda.gov. Gary D. Manners and Andrew P. Breksa III are in the USDA-ARS Processed Foods Research Unit, Western Regional Research Center, 800 Buchanan St., Albany, CA 94710; phone (510) 559-5813, fax (510) 559-5849. Darshan S. Kelley and Susan J. Zunino are with the USDA-ARS Western Human Nutrition Research Center, One Shields Ave., Davis, CA 95616; phone (530) 752-5138 [Kelley], (530) 752-5156 [Zunino], fax (530) 752-5271. "Citrus Compound: Ready To Help Your Body!" was published in the February 2005 issue of Agricultural Research magazine.